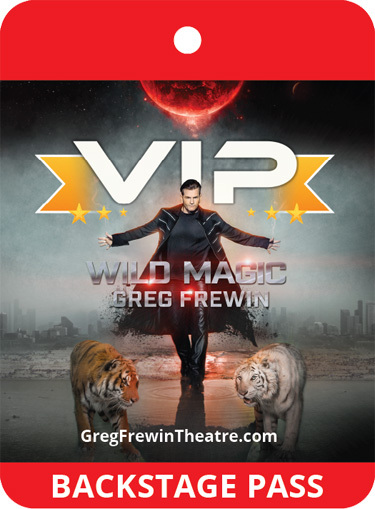 VIP Program after select evening & Saturday WILD MAGIC Shows. Please check with Box Office or Calendar for more details and for available dates. On our backstage tour, you get a special glimpse of what the show consists of. You'll learn all about the props, majestic animals and exotic birds that wowed you during the show. You'll also have the opportunity to meet these animals in a backstage tour- the only one like it in the world. This VIP experience in Niagara Falls is a small and intimate experience, with only limited passes on the tour. Greg takes you backstage and shows you the mechanics of the show. While he won’t reveal his secrets (trust us- we’ve asked! ), he’s very proud of the dynamics of the backstage set up. What a lot of people don’t know is that Greg actually builds a lot of the illusion sets and props himself! Greg is also an animal lover and educates anyone on the backstage tour about the animals in his show. He gives you their background story, what he feeds them, a typical day for them. During the tour, you’ll get the chance to see a tiger up close and might even get the chance to pet one. Treat yourself to the ULTIMATE Magical Experience, the best in family entertainment in Niagara Falls! Children under 18 years of age MUST be accompanied by an adult(One Adult for every two children); 21 years or older. VIP Pass Program, regrettably for safety reasons, is not available to children 8 years or younger. *Should minimum numbers not be achieved by show intermission; theatre reserves the right to cancel VIP program. *Limited Passes Available - On a first come first serve basis.